Forecasts are better off based on end-user consumption, rather than retailer orders. Suppliers need to stop asking what will the retailer order from us and start asking what should the retailer order from us, in order to meet actual end-consumer demand. In Part Four of this series we described practices that were successfully used to overcome the enormous challenges in managing product lifecycles and transitions. And here in Part Five we discuss how to get more accurate forecasts. In retail, the supplier often takes most of the demand risk. The retailer wants accurate forecasts to reduce inventory carrying costs and improve yields, but they don't have the same level of skin in the game that suppliers do, if demand doesn't materialize. The supplier usually is the one who has to pay for markdowns, spoilage, returns, and junking. Suppliers can successfully fill every customer order and still “lose their shirt.” Predicting demand based on orders from the retailer is challenging, because the order stream is filled with noise: forward buy distortions, buyers tinkering, order-type errors (marked as a promotion when it’s really a reorder), one-time shipments, etc. In addition, the order rates are sporadic, not a continuous flow. So suppliers need to stop asking what will our customer order and start asking what should our customer order to meet end consumer demand. They should change their goal from high fill rates only, to having high fill rates, high store-level in-stocks, and high sell-through. Most current systems and approaches struggle to meet these goals. They rely too heavily on retailers’ forecasts, because they don’t have a structured approach to intelligently incorporate POS data or the true impact of recent orders. POS data suffers from problems such as the "times key" issue (12 items of different flavors get entered as 12 of the first flavor scanned), missing registers, duplicate SKUs, and manual data entry errors when bar codes won’t scan. Fixing these problems is not easy for the supplier. It requires continual ongoing dialog, showing their retailers the benefits of implementing data discipline. There is less noise at the POS data level, though data cleanliness is still an issue (see sidebar “Dirty POS Data”). One planner at a consumer products supplier said: "POS data is beautiful. It's pure statistical data. Demand planning algorithms eat it up and the resulting forecasts are much more accurate [than order-based forecasts]." POS forecasting requires a system that can model the supply chain, and multiple steps to work backwards from POS demand to create a ship plan for the factory (see Figure 1). It must be able to model and adjust for A) lead times and B) inventory levels at each step of the chain, C) merchandising input (promotions, planned changes to product mix, pricing), and D) changes to market assumptions (competitors actions, such as new product introduction and price changes). Anything associated with a change in mix at retail level should be factored in as soon as it is known, usually months in advance. The retailers' POS forecasts (when available) should be compared by the supplier against their own POS forecast. CPGs’ typical monthly forecasting cycle is largely dysfunctional.1 The lag between receiving information and incorporating it into the plan prevents rapid responses to significant events, such as forward buys. Account level forecasting has not delivered promised benefits because most demand planning tools are designed to predict aggregate demand across many accounts where there is a continuous stream of orders or sales. At the account level, each shipment is interpreted as a recurring “seasonal” demand spike. In reality, if the account just bought something, they’re probably not going to buy it again soon. Completely different algorithms are needed. In addition, sales has very little solid information at the item/account level beyond the next few weeks, but is regularly asked for 3-4 months of promotions, many of which don’t happen, or happen, but with different items. There is typically a lag of several weeks between getting the information from sales and publishing it to manufacturing. The best companies are now updating the forecast daily based on meaningful events, and everyone executes to the most current, accurate numbers, not to something agreed to a month before. This requires new planning system algorithms that take into account not just seasonal trends from last year, but orders received yesterday. These algorithms understand that a forward buy does not indicate a surge in demand. By rapidly adjusting forecasts based on orders and POS data, companies significantly increase the accuracy of near-term (c. 4 week) forecasts, stabilize production schedules, and deploy inventory much more accurately to where there is actual demand. The technology to support n-tier collaboration has to be more than just spreadsheets for sharing data. Especially in industries like CPG, there are too many items and customers. We are seeing the emergence of tools from best-of-breed vendors that can synthesize large volumes of POS, shipment, and order data in meaningful ways to come up with a single more accurate forecast. 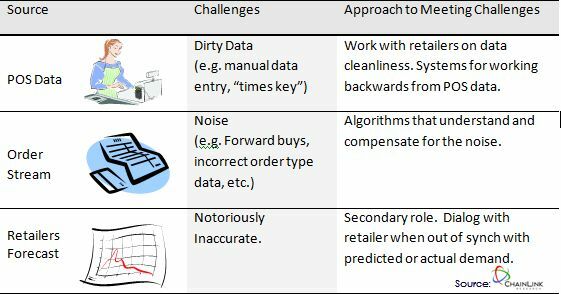 Synthesizing all of the data—POS data, orders, market trends and events, supply constraints, promotions—involves a combination of process disciplines (e.g. getting your sales people to actually enter important data), use of statistical tools (e.g. finding the right algorithm), and judgment (e.g. learning to assess the impact of events and trends). The results will be much more accurate forecasts with all the ensuing benefits of lower inventory levels, higher services levels, and reduced out-of-stock and markdowns. 1 For one thing, there is a mismatch between the planning time horizons for capital/revenue planning, product planning, manufacturing planning, and distribution planning as explained here. Return to article text above.